Washington, DC is renowned as city of historical monuments and come winter there is one that shines above all, the National Christmas Tree. This illuminated conifer lives in President’s Park on the White House Ellipse and is lit from late November through early January, accompanied by nightly musical performances throughout the winter holiday season. The tradition of the National Christmas Tree on the Ellipse began with President Calvin Coolidge over 90 years ago, when he lit a 48-foot Balsam Fir decorated with 2,500 electric bulbs in red, white, and green on Christmas Eve 1923. Today, the tree lighting remains a beloved holiday event in Washington, DC lit every day from approximately 4:30 p.m. to midnight, as part of the America Celebrates display at President’s Park (White House). The walkway surrounding the National Christmas Tree features 56 state and territory trees, decorated with handmade ornaments that are unique to each tree. Nightly music and dance performances take place on the Ellipse stage for two weeks in December. All performances are free and open to the public after the official tree lighting ceremony. The holiday themed performances include local school groups, as well as church choirs, dancers, and even a ukulele orchestra. From ice sculptures and downtown holiday markets to curated exhibitions of outdoor public light art installations like the Georgetown Glow, there is a wealth of free winter activities and holidays displays featured throughout the nation’s capital to enjoy when visiting over Christmas and New Year’s. 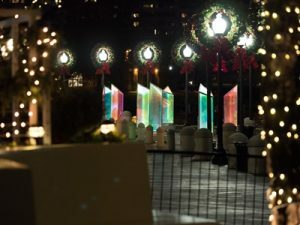 Visitors can also marvel at holiday-themed illuminated boats that traverse the Potomac River from the Alexandria waterfront to The Wharf where open fire pits await to cook delicious s’mores.